WORLD-BEAM QS18 Series: Convergent. Focal Point: 16 mm; Input: 10-30V dc. Output: Complementary Solid State NPN. 2 m (6.5 ft) Cable. Focal Point: 16 mm; Input: 10-30V dc. WORLD-BEAM QS18 Series: Convergent. Focal Point: 16 mm; Input: 10-30V dc. Output: Complementary Solid State NPN. 6″ Pigtail PICO-Style Quick Disconnect Connector. WORLD-BEAM QS18 Series: Convergent. Focal Point: 16 mm; Input: 10-30V dc. Output: Complementary Solid State NPN. 6″ Pigtail EURO-Style Quick-Disconnect Connector. WORLD-BEAM QS18 Series: Convergent. Focal Point: 16 mm; Input: 10-30V dc. Output: Complementary Solid State NPN. Integral Pico-Style Quick-Disconnect Connector. 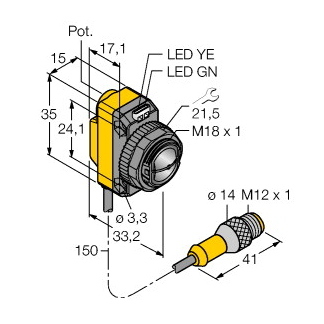 WORLD-BEAM QS18 Series: Convergent. Focal Point: 16 mm; Input: 10-30V dc. Output: Complementary Solid State NPN. Integral Euro-Style Quick-Disconnect Connector. WORLD-BEAM QS18 Series: Convergent. 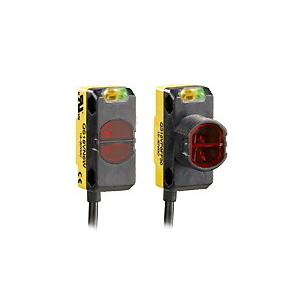 Range: 16 mm; Input: 10-30V dc. Output: Complementary Solid State PNP. 2 m (6.5 ft) Cable. Range: 16 mm; Input: 10-30V dc. WORLD-BEAM QS18 Series: Convergent. 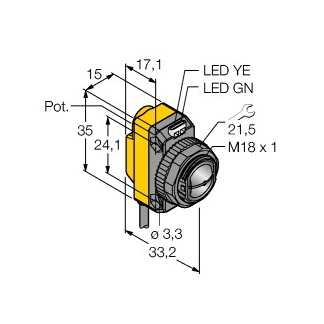 Range: 16 mm; Input: 10-30V dc. Output: Complementary Solid State PNP. 6″ Pigtail EURO-Style Quick-Disconnect Connector.